The park could be perfect for your next fishing holiday. Bodnant enjoys a picturesque location on the outskirts of the market town of Llanrwst in the beautiful Conwy Valley. Bodnant Caravan Park offers the following facilities. Myself and my partner with our two border collies stayed here for a week at the beginning of July 2016. We had not booked in advance and stumbled upon the site and received a very warm welcome. We had a camper van and awning and were given the option of staying in the main area with the caravans or in one of the two small camping fields. We opted for a camping field with electric hook up. From here it was an easy walk to the dog run area and also the toilet and shower block. The pitches were of a fantastic size which accommodated us in the van, our large awning and plenty of outside space for a picnic area. There were wooden picnic benches available which became part of our camp too. The facilities were spotless, the grass cut and the numerous flower beds extremely well tended to. We had fresh eggs from the farm and frequent duck visitors to camp as they roamed the campsite freely. They were never a bother, neither were the farm dogs that ran in an adjacent field. The camp itself was very peaceful with no rowdy groups allowed and by 11pm all was very quiet (if not before on all occasions). The campsite itself is on the edge of the town and a 10-15 minute walk gets you to an assortment of pubs, supermarket and lovely riverside cafe. We used it as a fantastic base for Surf Snowdonia (10 minute drive away) and the Zip and Cavern trips (35-40 mins). Snowdon is just down the road and sherpa buses are available closeby. In addition there is mountain biking right on the doorstep with the Marin track just over the river bridge a few minutes down the road. BBQs were no problem. If I had to be really picky the showers were hot but not boiling - I am a sucker for a very hot shower. This is an amazing small and special campsite beautifully kept and one to which we will be returning to. 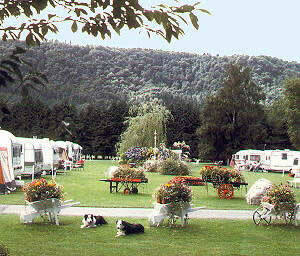 Have you been to Bodnant Caravan Park? Please submit your review so that others can benefit from your experience. Important note: Information provided here about Bodnant Caravan Park is based on our best knowledge. However, please check with Bodnant Caravan Park before booking to ensure that you have the information required. Reviews are the sole views of the contributor and do not necessarily represent the views of CampsitesandCaravanParks.com or Bodnant Caravan Park.